Rigid contact lenses, also known as rigid gas permeable lenses or RGPs, present wearers with a long-lasting durable option for contact lenses. RGPs are made from a rigid plastic that allows for oxygen to pass through, keeping the eye healthy. While these types of lenses are rigid they are not the hard lenses of the past that many people think of. Interestingly, RGPs are actually a newer design than soft lenses. 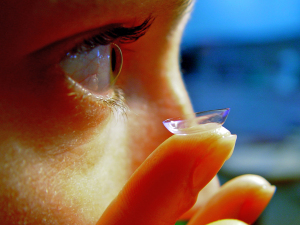 This fact may lead many people to wonder why so many more contact wearers use soft lenses. Consider these advantages and disadvantages. Rigid plastic material doesn’t change shape when user blinks, providing clearer vision. Extremely durable and won’t tear like soft lenses. Not made of water so proteins do not build up on contacts. Last for years with minimal care, as long as prescription remains the same. Less comfortable at the beginning. Smaller size means there is a higher chance of the lens falling out in physical activities. Since they are designed to move on the eye when the user blinks there is a high chance of dirt or debris getting behind the lens. Require consistent care since they are used for a long period of time. 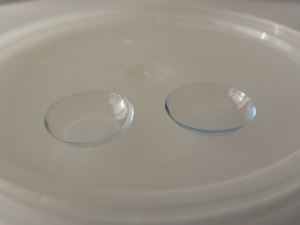 Soft lenses provide a comfortable experience for its users because it is made of hydrogel, which conforms to the unique shape of each wearer’s eye. This hydrogel material is a water-based polymer, which means that oxygen is transferred to the eye through water molecules. Soft lenses come in a variety of wear periods, everything from daily to monthly use. Comfortable from the first use. Do not require a consistent care routine, depending on wear length. Larger size means they are less likely to be dislodged in sports and physical activity. Small chance of getting dirt or debris behind the lens. Not as sharp of vision as with RGPs. Get protein build-up overtime and must be replaced or they could be a cause for infection. No, according to the CDC, over 30 million U.S. citizens wear contacts healthily everyday. Putting them on may take a few minutes the first time, but after a week or so they can be put in and taken out in seconds. Are they uncomfortable? Can I feel them on my eye? Depending on the type of contact lens you get there may be a short period of adaptation. However, with soft contact lenses comfortability is immediate, and most users comment that they can’t even tell that a lens is on their eye. Can I wear makeup and contact lenses or do I have to choose one? You can absolutely wear both. By putting contacts in first you can avoid transferring unwanted substances to your eye. Contacts allow for a full field of vision and remove the obstruction of frames. Contacts do not get fogged up or dirty with rain and dirt. Contacts do not slide off of your face like glasses and allow for greater physical activity. Many people find that their vision is better with contacts rather than glass. Contacts require regular and proper cleaning and storage. The initial visit to the optometrist is longer and requires more visits. If you would like to make the transition to clearer vision and see more of your world set up an appointment with Dr. Greitzer. The experience Dr. Greitzer has acquired working in Optometry since 1975 allows every client to feel safe and comfortable.